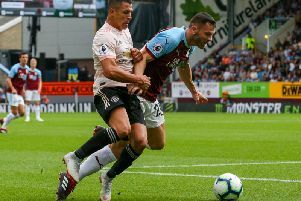 Burnley's Jack Cork is one of only seven outfield players who haven't missed a single second of action in the Premier League this term and boss Sean Dyche has put that down to the midfielder's understanding of the division. The 28-year-old, now 26 games and 2,340 minutes in to his eighth term in the top flight, is in the same company as Hector Bellerin, Lewis Dunk, Zanka, Harry Maguire, Alfie Mawson and Dale Stephens, along with seven goalkeepers. Having been there and done it, totalling 186 appearances at this level, adding six goals, Dyche believes that his summer signing has become a natural on the big stage. Cork, who made his first appearance for the club at this level against Fulham at Craven Cottage eight years ago to the day, returns to his old stomping ground at the weekend as the Clarets take on Swansea City in South Wales. Ahead of the trip to the Liberty Stadium, where Cork featured for the Swans in a 3-2 win last term, Dyche said: "The big thing with Corky is his understanding of the Premier League. I thought the first time we lacked it, I thought last year it improved with the group we had because they’re learning as they’re going. "And now they’ve raised their understanding. So not just performances, it’s that feel of being in the Premier League. "A lot of the players are a year wiser, some of them are two years wiser from the previous time. Well in their third year, they think that they’ve been in a stadium enough times where it’s a bit more normal. "Therefore you’re more normal and your performances are more adjusted. They think: We’re OK here. Then you add in someone like Corky, who’s been doing it for many years. "He’s probably at year eight or nine in the Premier League. So he’s been doing it for many years and now he has played every game. "No matter what walk of life you’re in, the higher a level you operate at, when that becomes more normal, and you can handle that, then you become more assured." Dyche added: "It’s game understanding. He’s been round the block. He’s played with loads of different players in a number of different sides and I think that helps, with the flexibility in his thinking. "He's doing really well. I think he’s enjoying it. He’s fitted in really quickly and accepted what we’re about. He had a background here, so I think that’s been a lot easier for him from a family point of view and all them things. "His wife’s from the north, so I think that helps, and because he’d been here before. Of course he walked into a whole different thing from when he was here last time. "I think they were changing at the ground and travelling down in cars to train here, so that was considerably different, but he gets the people, he gets the fans and the feel of the club. It’s changed quite a lot but he’s got a handle on it. "I’ve always thought he was a very good player down many, many years. Corky definitely plays his part."